Crispy on the outside, chock-full of filling inside, empanadas are the savory pastries of my dreams. On their own, they’re a good snack or appetizer, especially for happy hour. Paired with a big salad, you have a perfect meal (but then again, I’d say that about nearly any kind of dough-based baked good). 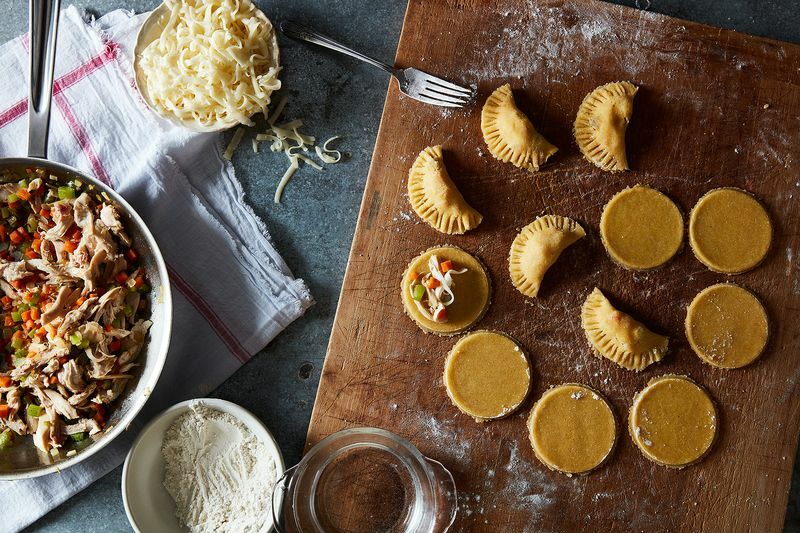 Empanadas are mostly about the filling, but a good dough is key. Traditional empanada dough is made a bit like an unsweetened tart crust: flour, salt (and any other seasonings), and butter are mixed to combine, then eggs and water are added until the dough comes together. 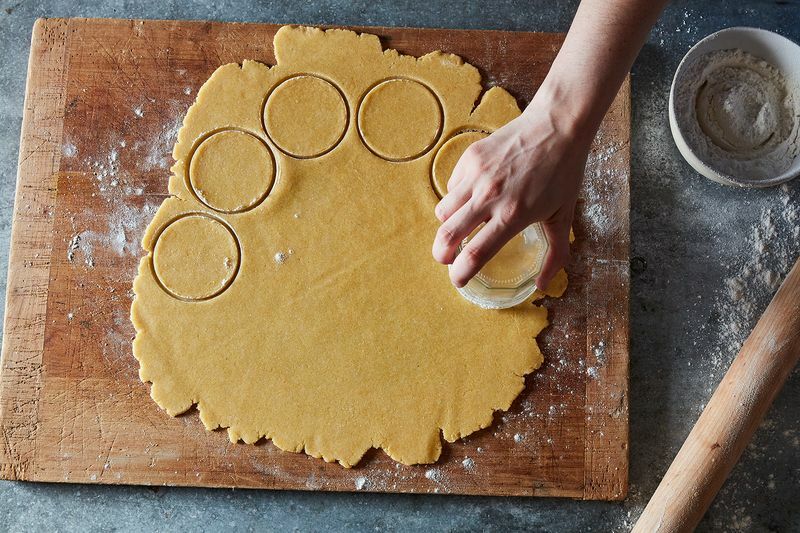 You can use almost any roll-out tart dough recipe (read: your favorite)—just be sure it’s smooth and pliable. But there’s other options, too. I prefer to use pie dough for a flakier exterior. Puff pastry works too! The star of any empanada is the filling. 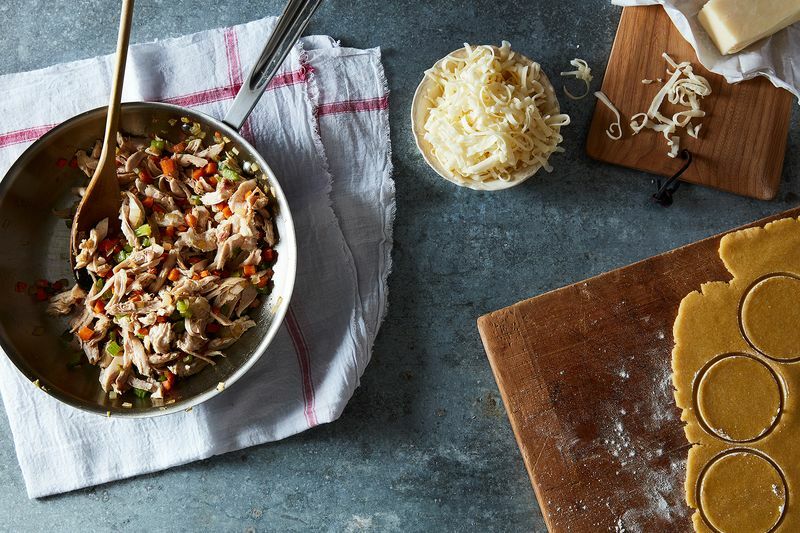 While you can just chuck leftover shredded chicken into an empanada, for the most flavor, you’ll want to cook some aromatics or sofritto, then add your filling choices to it, followed by herbs and spices of your choice. Whether you’re using leftovers or raw meat, this is a great way to bring flavor to the filling. The one thing to avoid is fillings that have too much sauce or liquid—they’ll seep out of the empanada. Meat: Cooked ground or shredded are my favorites, but small chunks work too! Fish and seafood: Yes, it’s meat, but you’ll want to prepare it differently. Chop it pretty finely or use a homemade ground mixture. Shrimp, scallops, and tuna are all great choices. Tofu or Seitan: Marinate it, then chop it up in cubes, a small dice, or a crumble to resemble ground meat. Eggs: Scrambled for breakfast, or hard boiled anytime. Cheese: Shredded melty cheeses, a scoop of soft fresh cheese, or crumbled hard cheese, depending on your other fillings. Vegetables: Grilled, sautéed, or raw all work. I like caramelized onions, sautéed mushrooms, grilled peppers, wilted greens, and roasted winter squash. More Starch: Rice, corn, grains, or thinly sliced or chopped potatoes. To assemble the empanadas, roll out your dough to about 1/8 to 1/4-inch thick. Cut the dough into circles using a floured cutter or the bottom of a glass. The larger the circle, the more room you’ll have for fillings, but it will also take longer to cook and larger empanadas can be harder to eat. I usually opt to cut circles 3 to 3 ½ inches in diameter. Have a small bowl of cool water at the ready, as well as a floured fork or your fingers for crimping. Scoop mounded filling on one half of the dough. (Around 2 tablespoons is a good place to start for a 3-inch dough round) Then brush one half of the dough’s edge with water. Fold the dough over the filling, then use your fingers or a floured fork to crimp the dough well. You want to be sure it stays sealed! If your filling has a lot of moisture in it (it's saucy or it has ingredients that retain moisture, like mushrooms), it can be a good idea to cut vents to help some of that internal steam escape. If your filling is on the drier side, you probably don't need to cut a vent. If the dough has gotten warm while you’ve been assembling, it’s best to refrigerate the empanadas before you proceed. 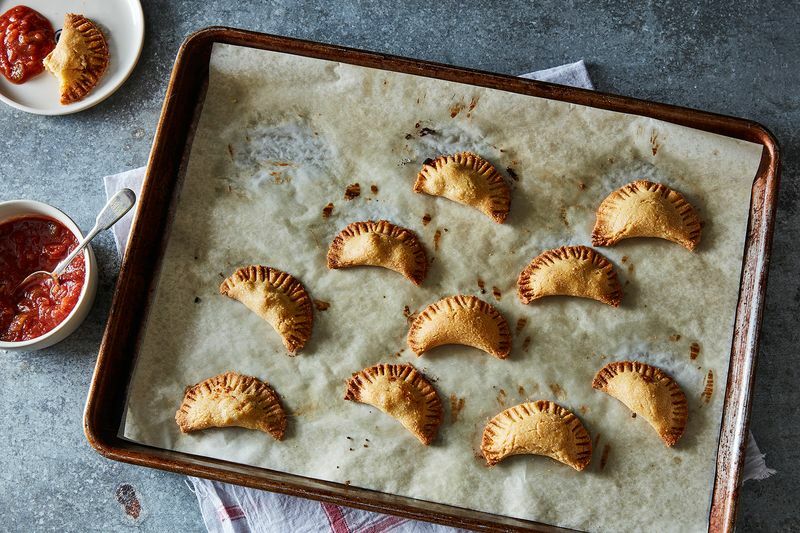 The next big decision when you’re making your own empanadas is how you’re going to cook them. The ultimate goal is a crispy crust, but there’s two very different ways to get there: baking or frying. One isn't necessarily better than the other: Fried empanadas will have an evenly crisp, golden brown crust and richness from the frying itself. Baked empanadas will be a little drier on the outside in comparison, but not dry! If you don't feel like frying, you can emulate the richness a little bit by brushing the empanadas with a little melted butter or good olive oil when they first come out of the oven. If you choose baking, empanadas can benefit from a brush of egg wash or cream before baking to help them brown evenly. Place them about an inch apart on a lined baking sheet. Use a relatively high temperature (375° to 425°F) to get it nice and golden and promote plenty of flakiness. How long they bake for depends on the size, shape, and type of dough you’re using. Many will need around 20 to 30 minutes. If you’re frying, the ideal temperature for the oil is between 325° to 350°F. You can pan-fry the empanadas in about 1 inch of neutral (vegetable, canola, or peanut) oil, or go for the full-on deep fry: Both are delicious. Now that you’ve got a crispy, crunchy empanada stuffed to the brim with plenty of filling, it’s time to talk condiments. Of course this can be as simple or as complex as you want, but I always consider the filling when picking the sauce. For example, a richer filling (think: cheese), might benefit from a tangier sauce (say, salsa verde). But as usual, the sky’s the limit: and for the record, I’m totally for having multiple sauces.